“One of the main reasons for introducing Sleuth was because previous systems were time-consuming and there was inconsistency in the referral and in the response to the referral. Sometimes referral forms weren’t completed because of the time it took but Sleuth has made these things happen so much quicker. The result is we get lots of up to date information about the children that we can immediately use to support referrals and improve communication. That information is available to all staff: tutors, heads of year, subject leaders and senior leaders. “The use of information is so much more purposeful now. All staff use Sleuth daily in their roles, they know what’s going on. As a classroom teacher, I’m going to be using it every time I see my students; same for tutors. Good and bad behaviour is looked at daily. I have an overview of it across the school; my day starts every day with Sleuth and reviewing the events of the previous day, speaking to heads of year and pastoral managers about what’s going on in different year groups. They in turn have those conversations within their year group and with tutors, with students and with their parents. The departmental leaders are able to see activity in their departments, which was almost impossible before we used Sleuth. With the subject teachers it’s also incredibly powerful. 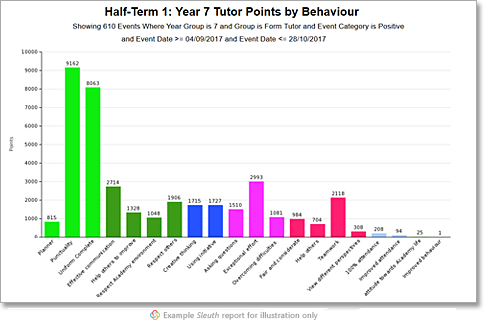 “Form tutors have a central role in a school, our tutors are able to have conversations on a daily basis with their tutees because the tutor is able to see what’s happening immediately and pick up the lower level incidents and also recognise the positives. “The tutor has a much better handle on progress and can use that in conversation to support individuals. Previously that relationship depended so much more on the personalities but now there’s information to support those conversations. Sleuth has really enabled that; it’s a really positive use of data and can change the conversation in a good way. “Perhaps the best example of how practice has changed is with our reward system. Praise is central to the ethos of the school. I really try to get across to all colleagues the importance of praise, and making that positive relationship with a child. We had tried different systems with varying degrees of success – house points, merit cards, stamps in planners – all difficult in terms of consistency and time-consuming to manage. We also looked at other electronic systems. “Praising positive contributions is so easy in Sleuth. Every teacher has Sleuth open for every lesson so when a child arrives on time that’s a positive Sleuth point and during the lesson there are lots of opportunities to gain more points for important aspects like teamwork, respect, setting a good example, etc., it goes beyond the purely academic learning towards learning how to be an outstanding human being. It’s a real battle in the modern school to balance academic learning and personal development. It’s important to us that we don’t lose the human aspect, well-being and emotional development. 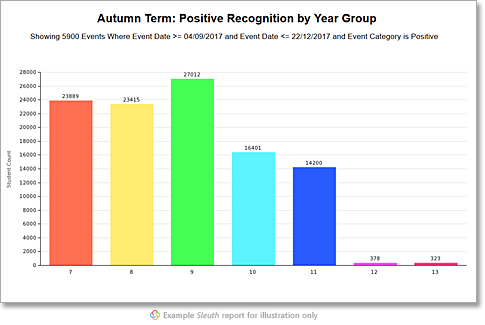 “We use Sleuth to track the points awarded for positive recognition throughout the year. A number of children were able to go on the end-of-year trip for free. Each points milestone reached reduced the cost of the trip for the pupil. If they got enough points for a golden ticket the trip was completely free. Some of those children are not outstanding academically or amongst the most vulnerable so would not have appeared at the top or bottom of any lists previously. We’re reaching far more of that middle group now which is significant. “The focus on praise has had a profound effect on the school; students who weren’t being recognised are now being recognised. When you are being recognised, that has a profound impact on your conduct. If you feel you are valued, you value where you are and you value others around you. “There is a community of kids developing here who will go out in the world and they’ll be great people. “It’s the end of break in a few minutes, there won’t be a bell because they’ve all gone. We’re relying on students to recognise that it’s time for lessons and that break is over. If you watch them walk into class, there is an urgency, you will notice the standard of uniform, their conduct as they walk through corridors. You would feel the energy in the school.